I don’t generally like to cross-reference reviews from other categories and I especially don’t like to start a review in the middle, but this deserves saying: the review for the Devialet Pro Expert 140 would have been materially different were it not for the inclusion of the Shunyata Research Delta NR power cords. The difference in performance was so marked, not only should Shunyata invest in a Devialet for demonstration purposes (and vice versa), but any member of the Shunyata team should be able to rock up at Devialet’s Parisian offices and demand the highest of high-grade croissant they get delivered daily. This is not synergy; what the Delta NR does happens universally... it’s just that the Devialet so benefits from what the Delta NR does, it’s almost laughable. The clue for the reason Devialet and Shunyata go so well together is in the name. That ‘NR’ suffix of the Shunyata Research Delta NR power cables stands for ‘Noise Reduction’ and it’s the most affordable mains cable in the company’s line to feature the brand’s patented CCI filter system. This is a multi-stage filter designed to limit the cross-contamination of mains from other products in the system or even the home. Normally, that kind of filtration requires a large box filled with ‘coils and caps’ or a large transformer designed to act as a buffer between the system and the outside world, but we’re fighting a losing battle, as there are power-polluting fifth columnists within our very audio equipment. Delta NR is the fightback. That might be good enough for some brands, but Shunyata Research doesn’t do ‘good enough’ at any price point. So the Delta NR features the company’s big 10AWG VTX hollow-core inductors, woven out of 99.99% pure oxygen-free copper. This makes for some relatively hefty conductors; larger than would fit into the typical off-the-shelf high-end plugs used with most good power cords. At this point, most companies would make a compromise, usually in slimming down the conductors. Shunyata makes its own connectors, which it calls CopperCONN. It’s actually a pretty good name if you ever see one of these plugs opened up because there is one heck of a lot of copper in there: no brass or bronze or even tough-pitch copper, just lots of high-purity copper. You can tell this by the weight of the plug even if you don’t open the connector; either the casing is made of stone (it’s not) or there is a lot of metal inside those plugs. Because of the size of the UK audio market relative to the US and EU, UK audiophiles are often short-changed here with off-the-shelf 13A connectors, but again that isn’t the Shunyata way. Some of the delay in bringing these products into the UK was designing a plug that worked to Shunyata’s specs. 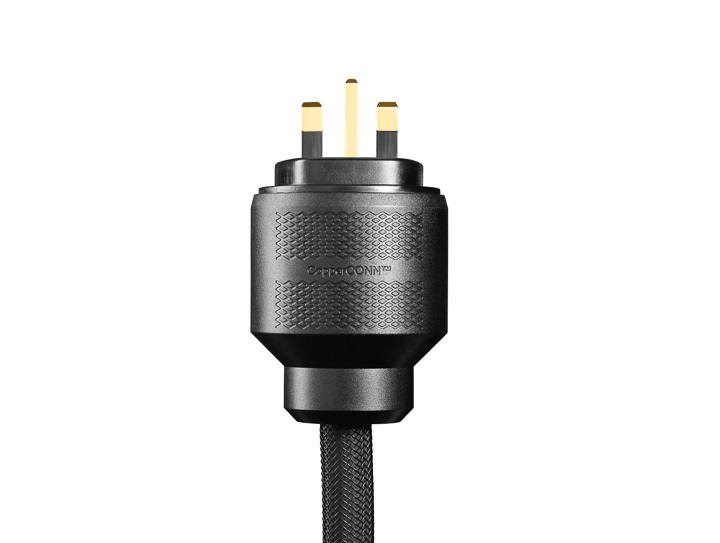 The cable itself is finished in a heavy black braided outer sleeve, and there are two sizes of IEC socket; the conventional large rounded model, and a more slimline EF design (which doesn’t include the CCI filter). There is no appreciable run-in, as Shunyata deploys its proprietary KPIP (Kinetic Phase Inversion Process) to do a lot of that job at the factory. The cable itself is relatively flexible. It’s supplied in a circular case that looks like it should hold a drummer’s hi-hat cymbals (or, if you live in the 1950s, a very flat trilby), and is best unrolled snake-like from its coils and used without hard kinks or bends. However, this is not one of those inflexible cables that lifts lighter products from their equipment stands.